Dance Studio Castle Rock:Is Dance an Art or a Sport? Among the age, old questions that have baffled people forever are the classics such as “Which came first? The chicken or the egg?” and for dancers everywhere, “is dance an art or a sport?”We at Castle Rock have our opinions, but we thought we’d look at this question and the ideas it brings up. When you are looking for a dance studio for your for child, boy or girl, from ages 3- 16, Castle Rock Academy is one you should consider. We offer Ballet/Tap, Lyrical/Jazz, Tap, Jazz/Pms, Hip Hop, Pointe, and more. Of course, dance is expressive. And art is expressive, so dance must be art, right? Well, we don’t want to fall into the type of logical fallacies that is used when someone says something like mammals have hair and give milk, and so, in that case, coconuts must be mammals. So what exactly makes dance an art? Let’s look a little closer. One factor that makes dance an art is indeed its expressive nature. Using his or her body, a dancer tells a story. They work with the music to tell of happiness, freedom, or tragedy. One thing to remember is that art requires discipline to succeed at. It requires mental and physical discipline. Just because your child can draw a picture does that make him or her an artist? The costumes, makeup, hair and controlled facial expressions all go into the performance. Dance is one of the performing arts, along with musicians, dance, opera, magic, mine and public speaking, to name a few. Sports are athletic pursuits that often involve competition and pushing the human form to its limits. 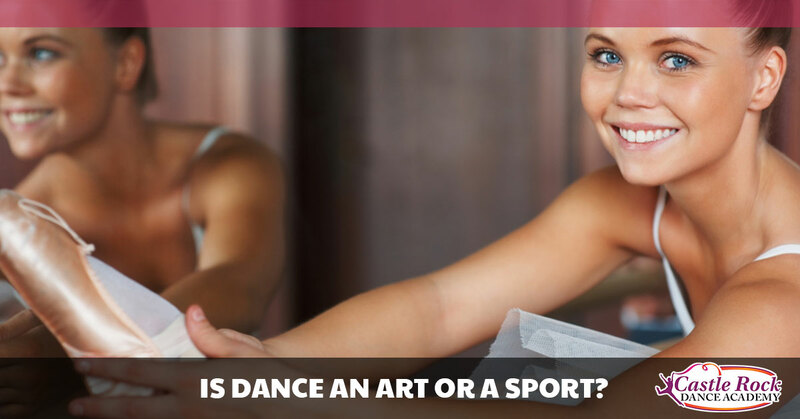 Sure, you can play kickball and be tired out by the time you get to second base, just as you can dance to music in your kitchen but does that make you a dancer? Perhaps it could be analogous a person who takes photos and a photographer: the difference is in quality and degree. Sport contains a high degree of competition, and many people don’t see dance as competitive since there is perhaps one or two dancers on stage, each doing their own thing. This argument crumbles quickly as the competition between dancers for a role in a dance performance can be fierce. Athletes push themselves to new levels of perfection and performance, and no one can deny that cancers do this. If we take the word performance from the artistic side of dance and the athletic element from the sports side of dance and you get an athletic performing art. We are sure the debate will go one, but we think it’s important to honor both sides of the argument to give great dancers their due. If your child is interested in dance classes, to express themselves or to explore the athleticism of it, call Castle Rock Dance Academy for more information.